In the upper reaches of the Tian Shan Mountains of Kyrgyzstan, beyond fertile valleys dotted with apricot trees and ancient Silk Road settlements, the arid climate isn't particularly friendly. "Tian" means celestial in Chinese, and the jagged peaks here are among the closest on Earth to the heavens: Jengish Chokusu, on the country's rugged, southeastern border with China, rises above 24,000 feet. The cold, thin air and treeless steppe seems more fit for snow leopards and Siberian ibex than for people, who for centuries have subsisted here by herding their horses and sheep across barren slopes in search of pasture. Even before the weather changed, it was never an easy place to live. Kurmanaliev, gesturing across a flat, exposed valley lying between umber foothills. A small brook courses through the middle, runoff from the steep flank of a mountainside dusted with late spring snow. Alongside the water, a low mat of grass carpets the rocky soil—an oasis at which a small herd of bony cows munches away. Kurmanaliev is 48, with a weathered face and thin moustache; he wears desert fatigues, his uniform as a part-time ranger at the nearby Sarychat-Ertash State Nature Reserve. For five generations, his family has lived in Ak-Shyrak, a remote village in the adjacent valley. Their modest home, like those of the other 30 families there, is a single-story, mud-brick dwelling with a pitched roof and powder blue window shutters. Beside it stand an outhouse and a livestock pen. Kyrgyz television news and Russian movies beam into the carpeted living-dining room from a satellite dish erected above the goats' enclosure just outside. There are electricity lines but no telephone link. For years, residents have relied on a predictable seasonal cycle. Each spring, they bring their cows, sheep, and goats to feed in the rocky ravines and basins where snowmelt collects. In a typical year, these wetland pastures grow well into October, when the herders harvest and stockpile the grass for fodder during the harsh winter months. But winters have become longer and drier, Kurmanaliev says. Warmer summers, meanwhile, have melted the layer of subterranean permafrost that holds groundwater close to the surface vegetation, so the wetlands are drying out. With more meager pasture in the fall now, villagers have resorted to buying hay from lower-lying areas—a five-hour drive away. It’s a familiar story all across Asia's high mountains. In the Himalaya, local farmers report the annual monsoon season now arrives later than usual; weather is more erratic across the region. Invasive species are creeping into higher terrain, rendering pastures unpalatable to livestock that is not adapted to these new (and in some cases toxic) plants; herders are forced to graze their animals in neighbors' pastures, causing conflicts within communities that never before existed. More worrying still is the rapid glacier melt now occurring in alpine regions, which is altering river flows and the seasonal availability of water. The melting also leads to the formation of glacial lakes behind relatively weak ice "dams," which can burst suddenly, flooding valleys below. The consequences of climate change threaten endemic species, downstream settlements, and agricultural productivity. Residents of Central Asia's high mountain communities, notes Karin Krchnak, director of WWF's freshwater programs, "are coming up against changes in their environment that their grandparents never saw." Central Asia's major mountain ranges—the Tian Shan, Kunlun, Altai, Pamir, Hindu Kush, Karakorum, and Himalaya—meet in and around Kyrgyzstan, and fan out across 12 countries. They hold the sources of fresh water for an estimated 300 million people. Conservation of these cross-border ecosystems in the face of climate change requires getting nations—even traditional adversaries—to collaborate. But how to get them to the table? As it happens, these high-mountain headwater areas are also the habitat of, and vital travel corridors for, the endangered snow leopard (Panthera uncia). "When you start thinking about ensuring the future of the snow leopard, you naturally come to the issue of watershed stewardship," Krchnak says. "That can be a nice, gentle segue to getting everyone together to talk about protecting these critical watersheds for the benefit of all." Omurbeck Kurmanaliev's elders used to talk about the snow leopard as a sacred animal. Its presence was viewed as auspicious. "They thought if snow leopards moved into the area, it would bring peace and prosperity," he says. Some Kyrgyz believe that the birth of a snow leopard in their area foreshadows a milder winter. Parents admonish their children to be as strong and clean as a snow leopard. "My father used to warn me," Kurmanaliev adds, "'Don't harm a snow leopard or it will bring about a curse.'" There are approximately 150-200 snow leopards in Kyrgyzstan today. It is broadly estimated that across their entire range, only somewhere between 3,500 and 7,000 remain. Nestled at 10,500 feet beneath the mountainous Chinese border, Ak-Shyrak was first established as a geological survey station for Soviet mining interests. The settlement sits in a treeless, high mountain desert whose lakes and tributaries make up the headwaters of one of Central Asia's great rivers, the Syr Darya, which flows west through Uzbekistan and southern Kazakhstan into the remnants of the Aral Sea. The extreme conditions and rocky, sparsely vegetated slopes at these elevations are ideal habitat for the snow leopard and its prey, which include the spiral-horned argali (also known as the Marco Polo sheep), Siberian ibex, and gray marmot. When the first settlers arrived in the area, the hills were full of argali. Omurbeck Kurmanaliev recalls his grandparents admonishing him not to kill female mountain sheep. "They gave us their homeland," the elders would say. But attitudes changed after 1991, when the Soviet Union collapsed and Kyrgyzstan gained its independence. Once Soviet mining operations ceased, hundreds of residents abandoned Ak-Shyrak. Those who remained began breeding cattle. Some, out of desperation, turned to poaching. "The income from argali and ibex meat and the skins of marmots and martens allowed us to stockpile food for the winter," Kurmanaliev says. When WWF began working there in 2009, almost 80% of Ak-Shyrak's population was hunting wildlife. 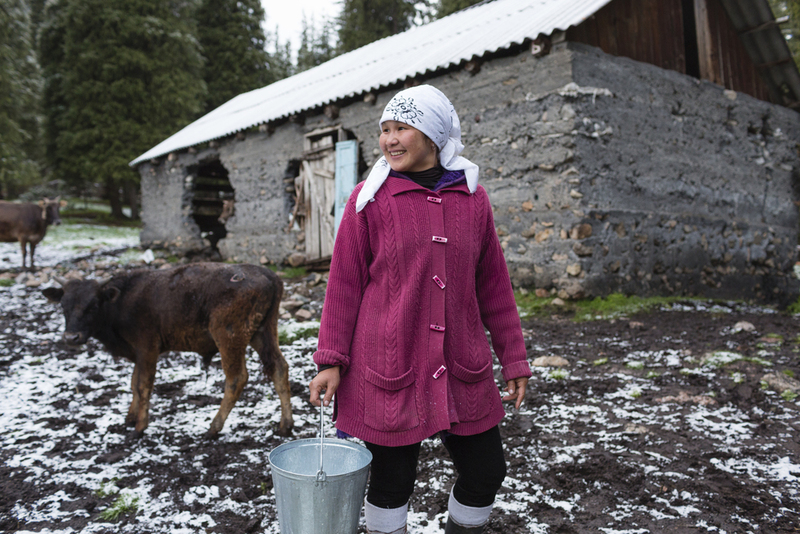 "Poverty was so high," recalls Farida Balbakova, WWF's project coordinator in Kyrgyzstan. "It was difficult to convince them not to poach, so we tried to offer them alternative sources of income." Balbakova remembers spending many sleepless nights contemplating the deforestation, disappearance of animals, and degradation of pastures that she witnessed across the country's various elevations and habitats. "I felt as if the land was asking," she says, "'Please save me.'" She was up against the all-too-often ingrained human tendency to regard nature and wildlife as things—almost exclusively—to be consumed. "I realized," she recalls, "it was first necessary for the villagers to see that the Earth was theirs to protect—that it belongs to them." She held workshops on alternative income for the adults, and taught ecological theater to the children, who performed skits and songs about biodiversity. She also organized games and festivals around events like Forest Day. "At first, children were writing about how argali meat was so delicious and tasty—because their parents cooked it for them," recalls Balbakova. "Now they're writing about how proud they are to see the sheep and telling their parents not to poach." With her husband, Azat Alamanov (who also works with WWF), Balbakova also organized the third annual Snow Leopard Festival, held in conjunction with the International Day for Biological Diversity. On a chilly Saturday in May 2015, about 160 people—residents from Ak-Shyrak and two other area villages—gathered in Ak-Shyrak's community hall, a cement building with a small stage and a rainbow globe light on the ceiling (the hall often doubles as the village discotheque). Teenage girls arrived at the event wearing leopard-patterned fur suits—each sported painted-on black whiskers as well. A grown man turned up in a brown bear costume. Outside the building, Kyrgyz soldiers from the nearby border outpost stood taking drags off cigarettes before going in. For his part in the festival, Omurbeck Kurmanaliev acted in a scene in which he played a bumbling poacher who gets his foot caught in the claws of an animal trap. A former poacher himself, he is now one of 10 local villagers who work as park rangers at the Sarychat-Ertash State Nature Reserve, an isolated valley over the mountain from Ak-Shyrak that contains Kyrgyzstan's highest density of snow leopards. Since the Kyrgyz government established the park in 1995, park territory has been doubled to nearly 370,000 acres (149,733 hectares), thanks in no small part to the efforts of Balbakova and other conservationists, who lobbied the president and worked to block mining exploration in the park. The reserve is home to five rare and endangered mammal species—snow leopard, Tian Shan brown bear, argali sheep, Siberian ibex, and Pallas's cat—a number of rare plants, and nine rare or endangered bird species, including the saker falcon, golden eagle, Himalayan griffon, Eurasian eagle owl, and ibisbill. WWF has provided technical support to the rangers, as well as uniforms, wildlife camera traps, and wind turbines that power two ranger stations. When the park was formed 20 years ago, the argali sheep population had dwindled to just 50 individuals—even the rangers were poaching them. Today, they number about 2,500. Ibex in the area have also rebounded. The last known poaching of a protected animal at the reserve occurred in 2008. In the past two years, high-level government delegations from all 12 snow leopard range countries have met in the Kyrgyz capital, Bishkek, and pledged to work together to ensure survival of the endangered cat. Those officials designated 2015 as the International Year of the Snow Leopard. According to a world bank report, Kyrgyzstan ranks third among countries in Europe and Central Asia that are most vulnerable to climate change. Global warming is expected to increase average annual temperatures throughout Central Asia, and bring about fewer frost days and longer-lasting heat waves. Severe droughts aren't expected to plague the region, as they are in parts of Africa and the Mediterranean, but Central Asia's mountains are expected to get drier as precipitation levels fall and glaciers, which feed the region's rivers, continue to melt. These changes have consequences not only for agriculture and drinking water supplies, but for downstream hydroelectric power generation as well. As temperatures rise and glaciers melt across Asia, forests will ascend to higher elevations in alpine regions, posing significant challenges for snow leopards and herders: Higher tree lines will put them in greater competition with each other for dwindling alpine grassland resources. The Bishkek Declaration, signed by the 12 snow leopard range countries in 2013, acknowledges that "mountain ecosystems inhabited by snow leopards provide essential ecosystem services, including storing and releasing water from the origins of river systems that benefit one-third of the world's human population." WWF, with USAID, hopes to accomplish more integrated, watershed-level planning and conservation action—from stanching illegal deforestation to encouraging best farming practices—that will increase the resilience of Asia's high mountain ecosystems to climate change. Alpine desert communities like Ak-Shyrak, for instance, are at risk of desertification, as overgrazing and more erratic weather conspire to render entire swaths of land untenable for both livestock and snow leopard prey, and erosion fills rivers with sediment that overwhelms hydropower turbines and irrigation systems farther downstream. "After the Soviet collapse, people started using the same pasture all year-round," Azat Alamanov explains. "We're trying to remind them of their parents' tradition of seasonal pasture rotation." 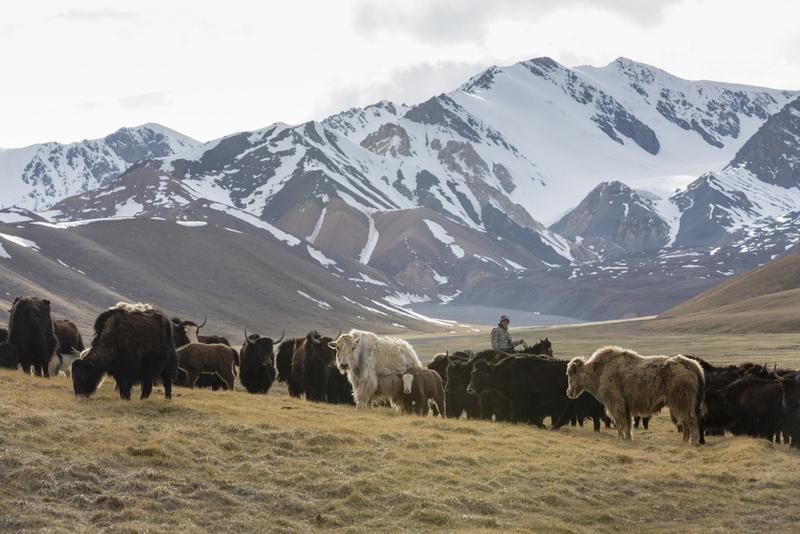 Balbakova and Alamanov are also encouraging local herders to switch from sheep and goat to yaks, a semi-wild, lower-maintenance animal indigenous to the Tibetan Plateau that is less taxing on the land and better adapted to the harsh native climate. This is an especially opportune time to switch to yaks, since yak meat is currently in demand in Central Asian cities because it is seen as "ecologically clean"—free of antibiotics and hormones. Three years ago, Balbakova and Alamanov introduced a WWF demonstration herd of 20 yaks that has since nearly tripled in size. Another way of adapting to climate change, of course, is to derive an income from sources other than livestock herding. WWF has trained local women to produce felt souvenirs that are sold at an annual crafts fair on Lake Issyk-Kul. Last year, Balbakova and Alamanov also set up low-interest, microcredit loan funds in Ak-Shyrak and Enylchek, another mountain village, seeding these funds with $5,000 per village and the stipulation that villagers not provide food, accommodation, or other assistance to poachers who pass through their areas. There are also plans to increase energy efficiency of buildings and promote renewable power. Still, it's only a start. More planning is needed, both from the Kyrgyz government and from other countries in the region, to mitigate climate impacts, expand protected area networks, and manage freshwater resources. Because we've learned repeatedly that no country can go it alone. Consider the Aral Sea, straddling Kazakhstan and Uzbekistan, which was the world's fourth-largest lake until intensive irrigation for industrial cotton drained the rivers that fed it. Today the Aral Sea is both a scrub-covered desert and a cautionary tale. As WWF climate adaptation and resilience expert Ryan Bartlett notes, the Aral Sea's fate is also "a harbinger of the kinds of regional water security challenges that will only become more difficult as climate change worsens." It is exactly the type of tough challenge that our snow leopard collaborations may help us start to address.